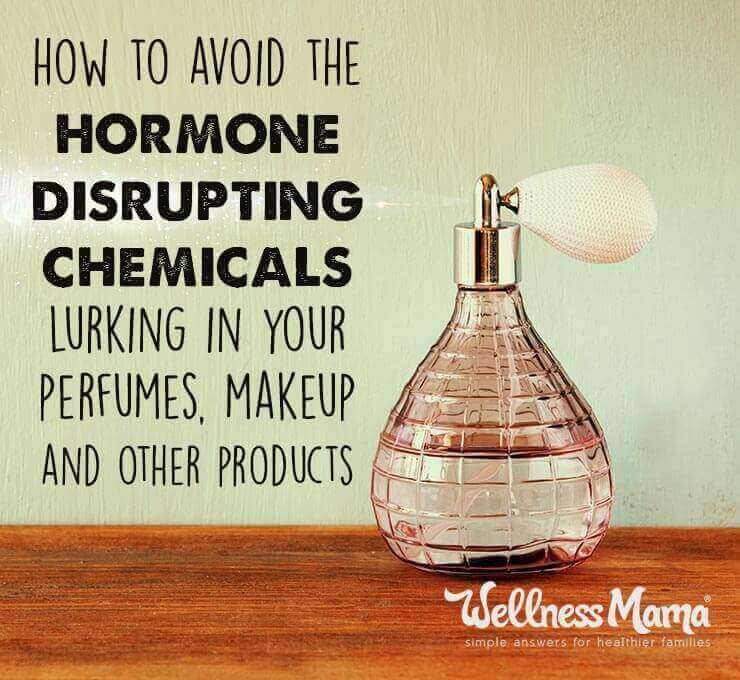 For those of us interested in nontoxic personal care, trying to navigate the ever growing list of chemicals to avoid can be overwhelming. Phthalates are on the Environmental Working Group’s “Dirty Dozen List Endocrine Disruptors,” but what exactly are they and what harm do they cause? Phthalates are a group of chemicals used to make certain plastics softer, more flexible and less fragile. Two million metric tons of them are produced each year! Sound like a lot? It is… Thats 4,409,245,244 lbs which equals the weight of 367,437 African elephants or 6 Empire State Buildings! Each. Year. Construction materials and industrial products such as: vinyl flooring, adhesives, detergents, lubricating oils, automotive plastics, solvents, materials, adhesives, varnishes, and wires and cabling for machines and appliances. Exposure to phthalates can occur by ingestion, inhalation, and through skin contact. Plastic storage containers can contaminate foods and drinks. We can breath dust that has come into contact with vinyl wallpaper, mini-blinds, shower curtains, or recently installed vinyl flooring. When we put phthalate containing cosmetics on our skin and near mucous membranes we can absorb small amounts. Of particular concern are the phthalates used in medical equipment. It can pose a problem for those who often need IV medical treatments, such as dialysis patients or hemophiliacs who require blood transfusions. Phthalates and their effects can be an occupational hazard for those who work in plastic manufacturing or with the many industrial products which contain the chemicals. Those at risk include individuals who work in home construction and remodeling, painters, printers, and those who work in plastics manufacturing. At the greatest risk for exposure however are young children under 36 months of age because they naturally put things in their mouth, especially their toys (which are often plastic). Unfortunately, infants and toddlers don’t understand the risks of putting things into their mouths, nor do they have the ability to exercise self-control and curtail such behaviors. The greatest concern is the way phthalates affect reproductive organs and hormones, especially in prepubescent males. Some have been linked to breast and other cancers, allergies, obesity, thyroid, and other hormonal disruption. To understand these risks in greater detail, let’s look at three specific phthalates. DEHP or DOP is most commonly used as a plasticizer in polymer products, often in flexible PVC. Flexible PVC (polyvinyl chloride) is used to make a number of products including building materials such as roofing, cables, flooring, and plumbing pipes. DEHP is also used to make blood bags and dialysis equipment. DEHP is in consumer products such as shower curtains, car interiors and even exercise balls. The highest exposure from consumer products occur in children and come from toys and other products related to childcare. Studies investigating the toxicity of DEHP have shown it affects two organs in particular: the testicles and kidneys. It can increase the size of kidneys, and the occurrence of kidney stones as well as the size of the stones. DEHP can also cause atrophy of the testes, decreasing their size and under very high dosages causing changes to sperm. It seems that pre-pubescent males are more sensitive to their effects than adults. Studies also show that DEHP can interfere with the function of the male endocrine system, affect sexual development, and lower fertility in mice and rats. There are many ways to come into contact with this chemical. The most common and effective exposure to DEHP is through intravenous interventions, such as a blood transfusion. Oral exposure, inhalation and absorption through the skin are also potential ways DEHP is absorbed. It is also possible to be exposed to DEHP, and other phthalates through the environment, especially for those who live near industries which use the chemical. Even those who don’t live near manufacturing facilities can be exposed through water run off from landfills, PVC pipes, and from buildings constructed with DEHP. According to a 2008 Risk Assessment Report conducted by the European Union, studies have found this exposure amounts to an average of 17 mg/kg/day (micrograms/kilogram/day) of DEHP. Infants can be exposed to 6 mg/kg/day of DEHP through breastmilk, or 13mg/kg/day through formula. In the general population, the highest exposures come from necessary and lifesaving medical equipment and procedures. Adults receiving long-term hemodialysis will produce DEHP metabolites in the urine at levels of 3.1 mg/kg/day and neonatal blood transfusions can generate metabolite levels of 1.7mg/kg/day in infants. 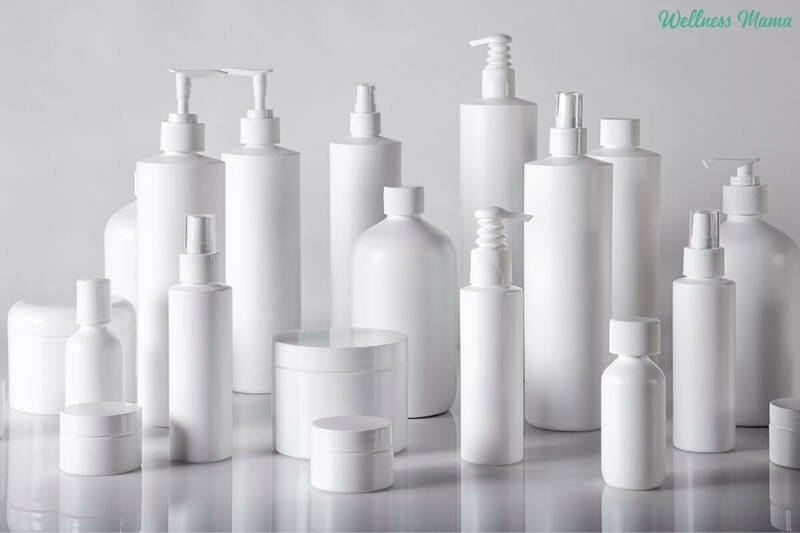 According to a survey conducted by the FDA in 2010, DEP is the only phthalate still commonly used in cosmetics as solvent and fixative in fragrance. In 2001 the fragrance industry was using around 4,000 tons of DEP annually. The European Union recommends the daily permitted exposure level of DEP to be 4mg/kg/day. 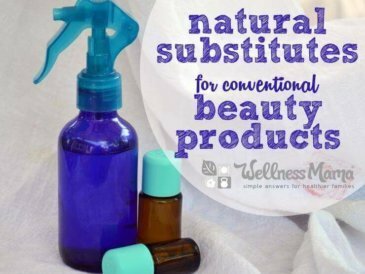 This is a much higher level than others, because it is considered to be one of the safer phthalates. In animal studies it took much higher doses than this to produce negative effects. Often, side effects were only observed in the offspring of the rats given doses of DEP, suggesting that the effects may be longer term than what has currently been studied. These developmental defects were delayed ear unfolding, delayed eye opening, and delayed vaginal opening in first generation pups. Embryo-fetal development studies carried out on mice and rats also observed a reduced number of pups per litter, reduced pup weight at birth, and an increased frequency of skeletal “variations” in pups after pregnant females were given high doses of DEP. Males also had decreased epididymal sperm concentrations. A 2003 report from the World Health Organization on the chemical stressed that these studies may not prove conclusive because DEP is present in the majority of laboratory equipment, therefore it is difficult to prevent contamination in control groups. DEP can be absorbed easily by the skin and disputed throughout the body, and in 1982 it was detected in 42% of adipose samples taken from children and adults that were either surgical patients or cadavers. We can be exposed to DEP through food which has been stored or shipped in plastic packaging. One study from Great Britain found that baked goods placed in boxes made from thin cardboard with plastic windows containing DEP had concentrations of the phthalate of 1.7-4.5 mg/kg even though the food had not touched the plastic! Low levels have even been detected in aluminum foil packaging. Like other phthalates we can also be exposed to DEP via our water, air, and medical equipment. Thankfully, surveys conducted in the early 2000s found that the average exposure levels of DEP were way below 4 mg/kg/day. One example is an American survey from 2000 which tested 97 women aged 20 – 40 years and found that the median exposure was 13mg/kg/day, (13 micrograms/kilogram of body weight/day) and the maximum concentration was 170mg/kg/day, which is 23.5 times less than the recommended daily limit of 4mg/kg/day. Currently DEP is considered to pose no health threat to humans and is therefore not regulated. DBP is has a lower molecular weight than other phthalates and is often used in combination with those of higher weights, especially DEHP. It is used as a solvent in many oil-soluble dyes, in printing inks, sealants and grouting agents, adhesives, film coatings, insecticides, other organic compounds, as well as a fiber lubricant in textile manufacturing. It has also been used as a perfume solvent and fixative, a suspension agent for solids in aerosols, a lubricant for aerosol valves, and a plasticizer in nail polish. Other animal studies found that oral injection of DBP affected fertility by reducing sperm production and causing testicular atrophy. Injection of DBP also decreased the number of litters and the number of live-born pups in each litter. It increased the incidence of structural malformations such as cleft palate, hypospadias or genesis of the prostate, epididymus and vas deferens. This being said, there is not enough evidence to conclude that is is carcinogenic, though some sources suggest that the mounting evidence points to this. It is not just the reproductive system that is affected either. A 2007 Taiwanese study found that pregnant women with higher concentrations of DBP had a tendency to be have hypothyroidism. The major source of DBP exposure to the general population is via the food supply, followed by drinking water, soil, and ambient air. Some researchers believe that we are getting a sizable exposure to DBP by inhaling it. DBP has been associated with increased allergic symptoms and decreased airway function. A Japanese study estimated DBP exposure to by 20%-30% of the dietary intake, with maximum daily exposure from indoor air concentrations to be about 136 kg/day. There are also concerns of occupational exposures to DBP through inhalation and repeated dermal exposures. In one workplace where workers accidentally encountered a large exposure to DBP, 33% of the female workers showed “deviations of the uterus.” Of the women exposed, there was a decrease in pregnancies and an increase in abnormalities of the estrogen and progesterone cycle. The participants in this study filled out questionnaires to help identify the source of the DBP exposure. From this information the researchers also concluded that the use of body and skin care products may have had a significant influence on the DBP exposure of the children. 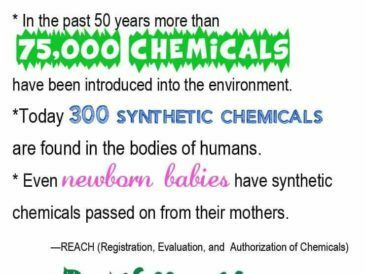 What is Being Done To Reduce Phthalates? Thanks to consumer advocacy groups, Congress caught up with the European Union and banned DEHP, DBP and BBP (butylbenzyl phthalate) to any amount greater than 0.1% (1,000 parts per million) for each individual phthalate in children’s toys or childcare articles that are designed to promote sleep, feeding or drinking, or aid teething or sucking (pacifiers). Here toys are defined as “a consumer product designed or intended by the manufacturer for a child who is 12 years old or younger for use by the child” during play. Three additional phthalates, DINP (diisononyl phthalate), DIDP (Diisodecyl phthalate), and DnOP (Di-n-octyl phthalate) were also banned on an interim basis to the same amount but only applied to toys that children could put in their mouth as well as childcare articles. In 2014 The US Consumer Product Safety Commission (CPSC) proposed another permanent ban of an additional five phthalates from toys and childcare articles. It recommends that DIBP (diisobutyl phthalate), DnPP (di-n-hexyl phthalate), DINP, DPENP, DHEXP and DCHP be permanently banned under the same regulations and it recommended lifting the interim ban on DIDP and DnOP. Even with the recent regulations, phthalates are ubiquitous in our modern world. While there are many sources that we can’t avoid, there are many ways we can limit our exposure. You have probably heard me say this one before. 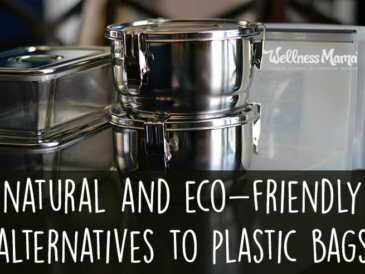 Trade plastic food storage containers for glass or ceramic and avoid buying food wrapped in plastic. Opt for reusable produce bags when shopping at the grocery store. Trying to avoid plastic wrapped meat can be difficult, especially when shopping at farmer’s markets. Often it means purchasing from the butcher’s counter instead of picking up protein from the meat section or talking to a local farmer about wrapping in paper or other materials. Zip lock bags come in handy for weekly meal preps as a way to store left overs or chopped vegetables. There are phthalate-free plastic bags available or a better option are these biodegradable bags. 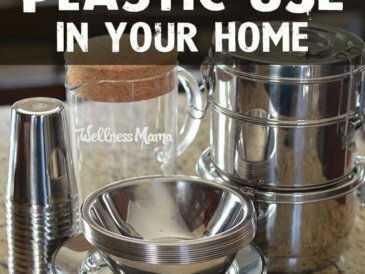 We’ve also switched to food safe silicone storage bags which are not only reusable, but dishwasher safe too. Since phthalates are oil soluble it is especially important to purchase cooking oils in glass bottles and jars. Look for PVC free air mattresses, and/or cover mattresses with a sure guard mattress protector. While regulations limit the amount of some phthalates in toys these don’t often apply to school supplies. Avoid plastic backpacks, pencil cases, and binders and opt for cloth or cardboard. Since companies do not have to disclose their fragrance ingredients and phthalates are often used to stabilize them, opting for fragrance-free cleaning and beauty products is key. 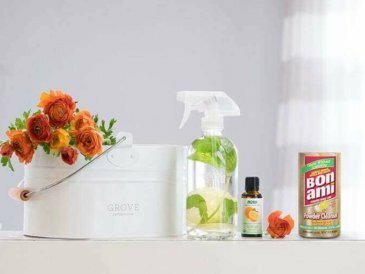 Check out some of my natural and green cleaning recommendations here. 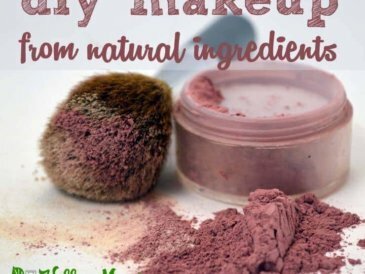 When I tell people I make my own beauty products, they often comment that it seems too complicated or that they don’t have the time. I find it complicated and time consuming to spend hours in the beauty section trying to decipher ingredient labels! Were you aware of the dangers of phthalates? Do you avoid them?